Monteverde's rich cloud forest and remarkable landscape make it naturally perfect for extreme Canopy, Canyoning & Rappelling Tours. The thrill and excitement never fade once you have tried this ultimately exhilarating experience of a lifetime. 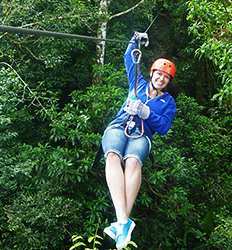 There are lots of popular activities in Monteverde you can indulge, but if you want a second to none extreme experience, Monteverde Canopy Extremo is the best place to go. It's labeled as the most extreme canopy in Costa Rica, so get ready to experience unlimited sorts of spine-tingling excitement and delight. Feel like a real superhero as you fly in a flash through the enchanting cloud forest of Montverde. You can also experience the most intense swing of your life with Monteverde Extreme Super Swing. It's 10 times the thrill of a normal playground swing you used to play as a child. If you and your friends are into bungee jumping, you can multiply the fun by going extra intense with Monteverde Bungee Jump Extreme. Activate your exhilaration as you make the most petrifying jump of your life. Soar 143 meters of spine-chilling free-fall, and feel the most bloodcurdling, nail-biting, crazily exciting experience ever. 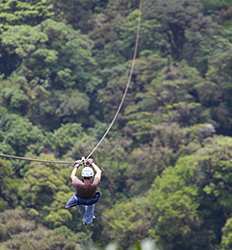 Costa Rica adventure parks are all the rage, and 100% Aventura is the best adventure park in Monteverde. Combine your canopy tour with a super Tarzan swing, a horseback ride through the cloud forest, or add a bit more adrenaline with our cloud forest ATV combo all available at the 100% Aventura Adventure Park. If you are up to encountering Monteverde Reserve up close and personal, you may also opt for Finca Modelo Canyoning. Rappel down to, not just one, but 6 extraordinary Costa Rica waterfalls. Dangling from a harness sound a little too risky for you? Take your adventure to new heights with Monverde Sky Tram as you rise up to over 5,250 feet in the open air gondolas. Grab this moment to learn exciting things about the wonders of flora and fauna before you ride or zip back down to the operations base. The Real Deal Tours helps you create the most memorable experience of your life. Take a look of our selection of Monteverde Canopy Tours, Monteverde Canyoning & Rappel Tours, and Aerial Tram options below and choose your cloud forest adventure today! Looking for a canopy tour with a little something extra? The 100% Aventura Canopy Tour has it! Countless zip line tours are available in all regions of Costa Rica, and the activity itself is such a fine blend of adventure, natural rainforest beauty, friendly locals, that it’s hard to go wrong with a canopy tour. 100% Aventura Canopy Tour deposit is $10.00 per person. Look!! Up in the cloud forest! It´s a bird…it´s a plane...no, it´s SUPERMAN! On our Monteverde Canopy Extremo you too can be a hero and fly like Superman through the cloud forest of Monteverde! Canopy Extremo earned its name for being the most extreme canopy in Costa Rica!! Monteverde Canopy Extremo deposit is $10.00 per person. Remember swinging as high as you could as a child on the playground swings and feeling a rush like you were flying through the air? Who doesn´t?! Get ready for that same excitement times ten on our Monteverde Extreme Super Swing! 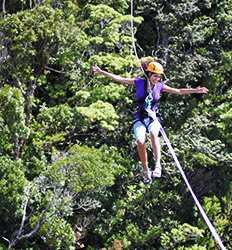 Book this adrenaline pumping Costa Rica Super Swing adventure with The Real Deal Tours now! Monteverde Extreme Super Swing deposit is $5.00 per person. 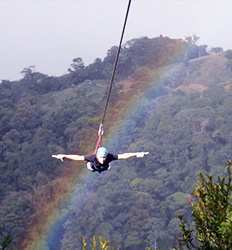 For the most extreme vacation experience in Costa Rica, we highly recommend our incredible Monteverde Bungee Jump tour! This extreme bungee jump allows you to launch yourself off of our aerial tram and soar 143 meters of intense free-fall. Not for those scared of heights, only the bravest of the brave will dare the Bungee Jump! 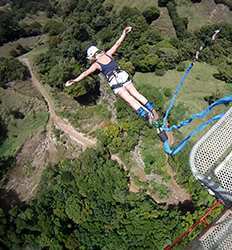 Monteverde Bungee Jump Extreme deposit is $9.00 per person. Want to do more than just look at pretty cascades? How about rappelling down 6 incredible Costa Rica waterfalls?! Our Finca Modelo Pure Trek Canyoning is the ultimate experience for adrenaline junkies who want to experience the Monteverde Reserve tropical forest up close and personal! 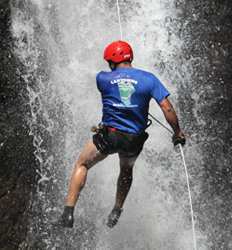 Finca Modelo Canyoning deposit is $15.00 per person. Our day starts on the Monverde Sky Tram where we will ascend up to an elevation of 5250' in our open air gondolas giving you the chance to pause and learn about the flora and fauna of Monteverde's cloud forest before zipping back down to our operations base. This tour is "Without Lunch", for more options see details. 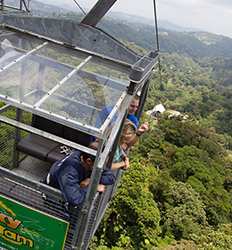 Monteverde Sky Tram & Sky Trek Zipline Canopy Tour deposit is $5.00 per person. This tour departs at six different times. Looking for the ultimate eco-tour in Monteverde? If you want to experience all the most popular activities in Monteverde and you only have one day, then the Monteverde Sky Tram, Sky Trek and Sky Walk combo is perfect for you! We´ll zip, glide and trek our way through the beautiful Monteverde cloud forest in 3 fun and unique activities. Monterverde Sky Tram, Sky Trek, and Sky Walk Hanging Bridges deposit is $10.00 per Adult and $5.00 per Child.